Adapted from a similar program in the USA, the “Red Socks” pilot project rolled out on two units at St. Paul’s Hospital in August 2016 to increase visibility of patients considered high-risk for falling. In conjunction with Falls Injury Prevention guidelines, red socks are helping staff to more easily identify patients who are at risk for falling and reducing harm as a result. We hope their success will inspire others to try out red socks! Falls prevention has always been a key priority for St. Paul’s Hospital, which recently adopted new Falls Injury Prevention guidelines across the organization, and this new cost-effective approach is raising more awareness about this important patient safety issue. Last fall, the Red Socks pilot project kicked off on 5A and 5B, the cardiac medical and surgical units, where many patients are considered high-risk for falls due to the side-effects of sedation, multiple medications and heart failure. 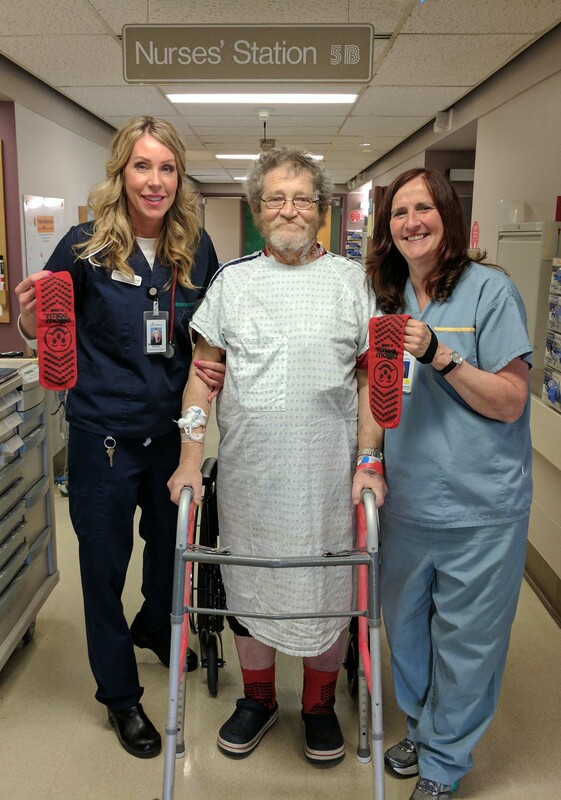 Rachel Garner, Clinical Nurse Leader, and Lucy Wilkinson, Physiotherapist, assist a patient wearing red socks to help raise awareness about falls prevention at St. Paul’s Hospital. Karen LeComte, Clinical Nurse Specialist, St. Paul’s Heart Centre, and Meghan MacLeod, Performance Improvement Consultant, St Paul’s Heart Centre, who led the project say red socks are a visual cue to anybody who may come in contact with patients at risk – especially when they are away from their room where signage indicating “falls risk” resides. By having that visual awareness, hospital staff, the patient’s family and other hospital visitors will pay particular attention and offer assistance if a patient is struggling with mobility. Congratulations to the 5A and 5B teams! How is your organization preventing patient falls? Leave your comments below or contact us with your story! The 5A and 5B teams would like to acknowledge the St. Paul’s Foundation Patient Enhancement Fund for their generous donation to the Red Socks pilot project. Rachel Garner, Christine Albay, Holly Andrews and Carrie Bancroft are Clinical Nurse Leaders in the Heart Centre Surgical and Medical inpatient units. Their role in managing the daily operations of the cardiac units enables them to provide direction and monitor quality improvement initiatives such as the red socks project. Susan Roth and Jenn Mutch are Clinical Nurse Educators in the Heart Centre. Their role supports education on practice changes that enable quality improvement, including the Red Socks pilot project. Julie Carleton is a Professional Practice Consultant at Providence Health Care. She championed the idea that brought red socks to the Heart Centre! Did you know that even non-injurious falls can increase patient length of stay? This idea should go Provincial and National! Such a simple, effective and inexpensive initiative which benefits everyone.